A highly specialized metallic jig, designed by Rapture with computer assistance to achieve the combination of two apparently incompatible goals: the achievement of high casting distances and the particular ability to get to the bottom through erratically and unpredictably swinging. The first of the two characteristics is exploited on feeding bonanzas, using a linear recovery, while the second one is valuable to stimulate the predator’s shoals hunting at higher depths. We know that at sea the first sign of difficulty for any living being is its irregular sinking, with intervals of temporary vitality. That’s the way of ideal fishing style for these fantastic jigs: the free flat fall, interspersed with slow pitch jigging; such action is much less stressful than the traditional jigging, but just as equally effective in terms of catches. The silhouette of the body differs on the two sides: the spine is flat, while the belly is convex, with a diamond cut which shifts the center of gravity toward one end, just for the above ballistic requirements. Given the prospect of challenging fights, the whole metalware has been chosen from the best available in the industry. The two assist hooks in the head area and the single one on tail, both made from hi carbon steel with 3D Cut points, are set to robust solid rings via a PE cord. 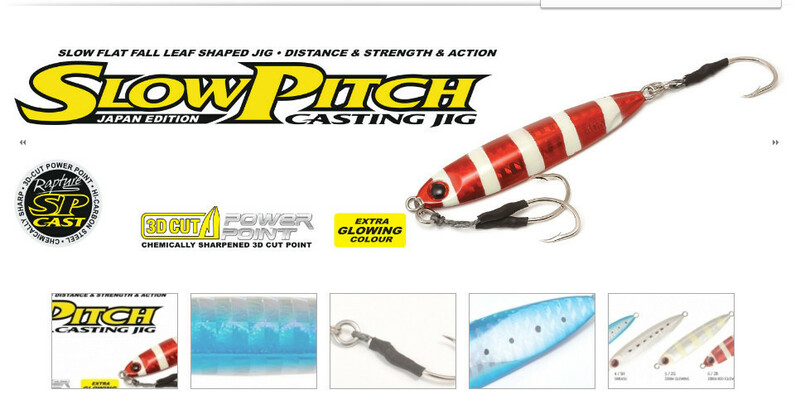 To encourage the use of these jig during dark hours, like dawn and dusk, the range of available colours includes four versions with glowing paint finish, which can take in light from a lamp and produce an irresistible attraction once in the water. On the body of each jig the weight in grams is finely engraved.